The outcome of Brazil’s Presidential election taking place this Sunday is of the greatest importance for the people of Brazil, Latin America and for all progressive people across the world. A victory for the far right front runner, Jair Bolsonaro, would be catastrophic: the safety and welfare of tens of millions of Brazilians will be in peril, Brazil’s democracy will be under threat, the struggle to stop climate change severely compromised and Brazil’s independence and sovereignty undermined by the handing over of the country’s foreign policy to Donald Trump in Washington. Aggressively stepping up the US’s policy of regime change against the socialist government of Brazil’s neighbour, Venezuela, will be high on the list of priorities for Trump if Bolsonaro wins the Presidency. Only a victory for the Workers Party candidate, Fernando Haddad, can prevent this disaster and instead set Brazil back onto a course for social progress and independence from the US. Haddad is standing to build on the progressive legacy of Lula who as President, from 2003 to 2011, brought tens of millions of people out of poverty and implemented a wave of inspiring social programmes that improved living standards for the majority of Brazilians. As Lula’s Education Minister from 2005-2012, Haddad was responsible for vastly expanding access to education for the working class, Afro-Brazilians and Indigenous students. With regards to the policies being put forward in this election, Haddad and the Workers Party are proposing to use part of Brazil’s foreign exchange reserves for an infrastructure investment fund and to ease the cap on budget spending – they have also ruled out the very unpopular right wing priority of radical pension reform. The Workers Party’s economic and social policies are in sharp contrast to the ultra neo-liberal austerity programme and attacks on living standards that Bolsonaro is planning. Haddad is also seeking to build upon Lula’s progressive foreign policy which charted a new course for Brazil, independent of the US – another stark contrast with Bolsonaro’s programme who wishes to transform Brazil into a satellite of the US. 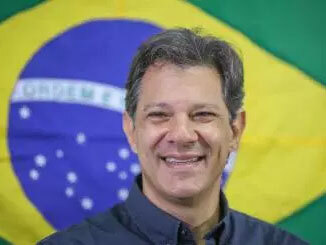 Haddad has spoken out against Trump’s aggressive trade war against China, pointing to the negative impact this conflict could have on Brazil’s economy, stating “no one is safe from ‘America First’.” In the face of such protectionism, Haddad would seek to enhance international trade through the strengthening of BRICS. His “absolute priority” in foreign policy would be to radically strengthen Latin American integration. Brazil is at crossroads and the stakes are enormous. The left and all progressive people and movements across the world should have no hesitation in supporting Fernando Haddad in this crucial election. Victory to Haddad!